Paquin model imported by Hattie Carnegie; Delineator, Dec. 1926. Original model by Frances Clyne, in green and gray. Delineator, Dec. 1926. Titled “Green and Gray,” the caption says “The New York version of the Paris ensemble is made by Frances Clyne in sea green bordered with dyed gray fox. The coat of green French wool swings slightly from the shoulder and is made with the new double animal collar. The frock is of green satin opening over lighter green crepe Elizabeth.” Frances Clyne operated an exclusive New York dress shop; in the 1930s, it was on Fifth Avenue. This Butterick advertisement showed women how similar styles could be made at home, or by your own professional dressmaker. 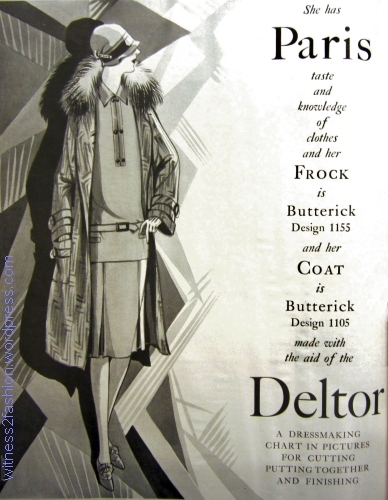 Ad for Butterick patterns from Delineator, Dec. 1926. 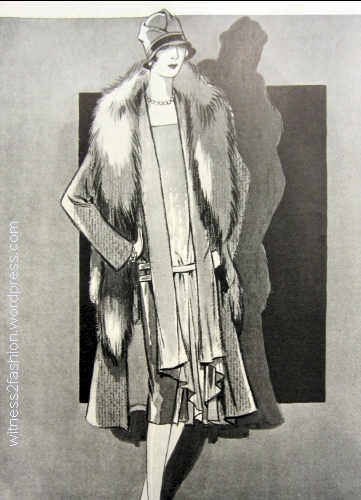 Butterick coat and dress patterns, Dec. 1926; A Chanel suit, January 1925. Both illustrations are from Delineator. 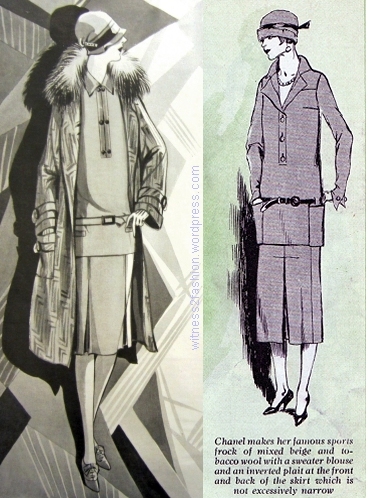 The dress shown with the coat (left) shows the lasting influence of Gabrielle Chanel’s outfit from January 1925. The proportions of the tops are slightly different to balance the skirt length, which has risen drastically in just two years. 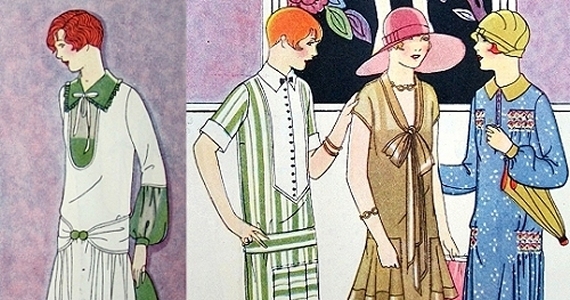 Here are four more styles from Butterick, featured in the same December 1926 issue. 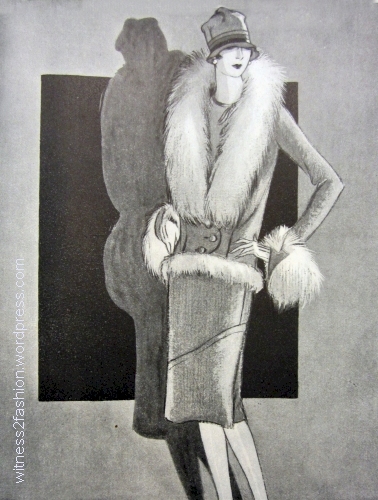 Butterick coat and dress patterns, Delineator, Dec. 1926. 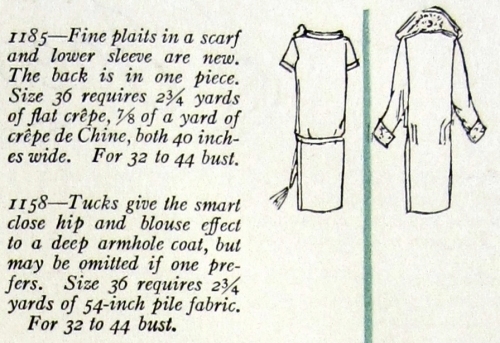 Back views and description of Butterick 1174 and 1157, Dec. 1926. 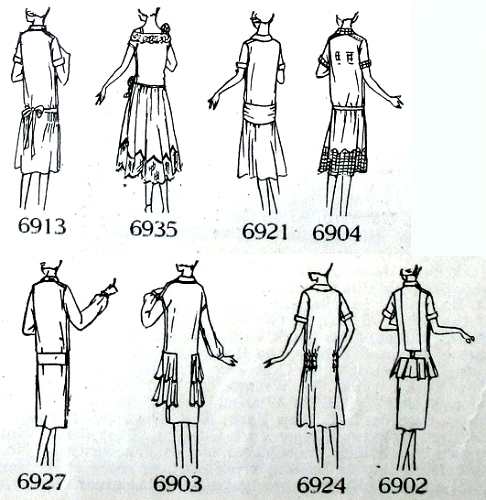 Back views and description of Butterick patterns 1185 and 1158. Dec. 1926. [Fine ‘Plaits’ means fine pleats, not braids.] The backs of many 1920s dresses and coats were straight and plain, but this coat is snugged to the hip with tucks in front and back. Also, notice how similar many of these 1926 cloche hats are, with pinched or dented crowns. 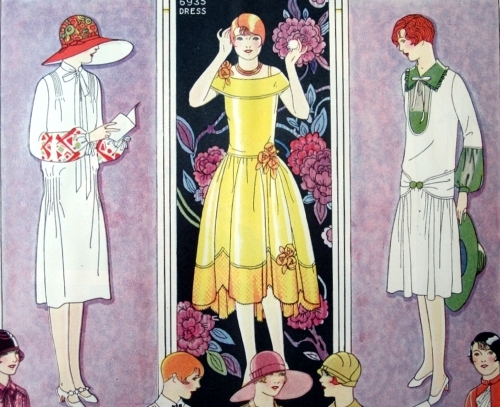 Four cloche hats from Dec. 1926 Delineator. Butterick Patterns for Misses Age 15 to 20. Delineator, p. 27, July 1926. 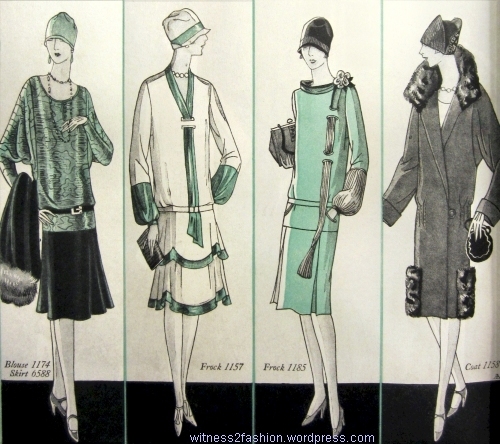 By the summer of 1926 the “look” we associate with the 1920s – short skirts, no waists, and a horizontal line across the hips – was truly the dominant fashion. 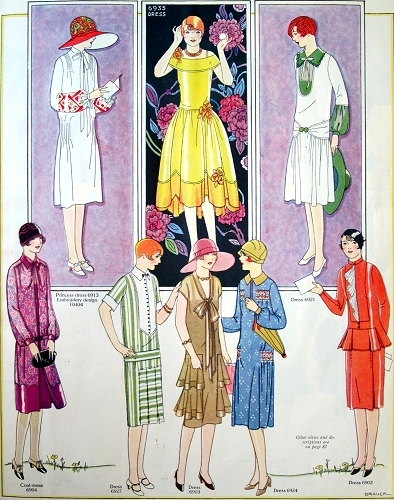 These dresses for Misses – i.e., women aged 15 to 20 – look fresh and youthful, especially in contrast to the long, tubular fashions of 1924. Seeing these designs in color is a treat, and a reminder that the clothes worn in silent movies were not actually black and white. In Butterick patterns, a Misses’ size was shorter than a Ladies’ size. Misses patterns were sold by age [! 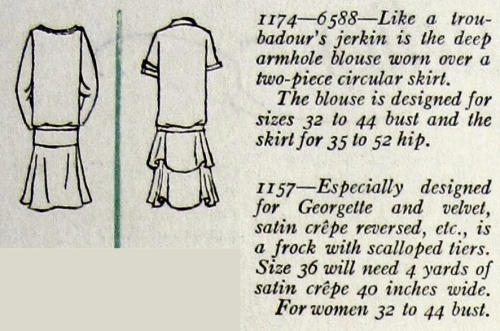 ]; Ladies’ patterns were sold by bust measurement. For most of the 1920s, “Size 15 years” equated to “petite with a 32″ bust.” “Size 17 years” meant a petite with 34″ bust, “19 years” fit a 36″ bust, and “20 years” was a petite 37.” Often a style is described as “For Misses and small women;” several of these styles say they also come in Ladies’ sizes 38 and 40. 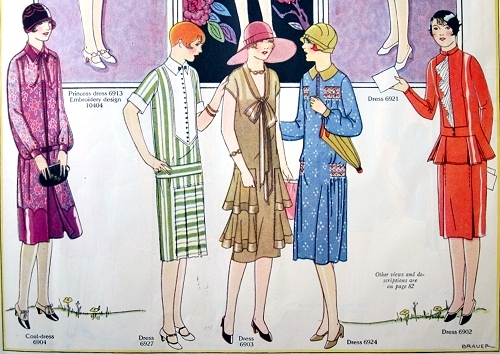 The usual run of Butterick Ladies’ sizes in 1925 was 33″ through 44.” Articles in Butterick’s Delineator magazine sometimes gave fitting advice for short women, but special patterns for adult women who were 5″ 4″ or shorter had not yet appeared. Bottom of Page 27, Delineator, July, 1926. 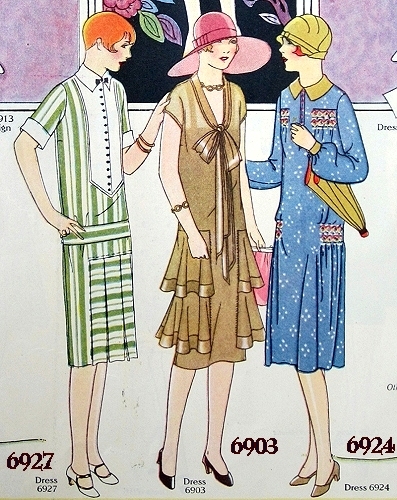 The dresses on page 27 were for young women – for flappers. 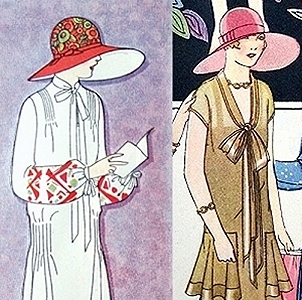 Styles for mature women were subtly different, as were the proportions of the fashion figures that illustrated them. 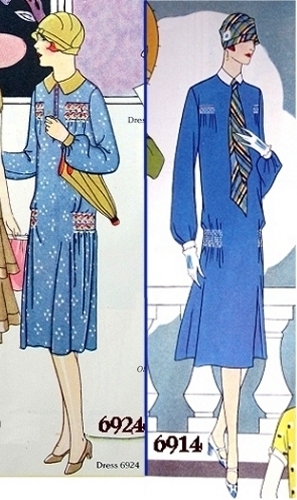 These two dresses appeared on pages 27 and 28 of the same issue. Obviously, the Misses’ illustrations are much less distorted. 6935 — A transparent hem, rising in front, is the latest Parisian offering in evening frocks This slip-over orange dress closes under the left arm, has a basque and a lower edge scalloped or straight. Lower edge 2 7/8 yards…. For misses 15 to 20 years, also small women. [This dress is interesting for many details. It is an early example of the short-in-front-long-in-back evening dresses of the late 1920s. It is clearly inspired by Jeanne Lanvin’s robes de style. And it has a side seam fastening – presumably snaps – under the left arm, which should be of interest to vintage dealers trying to date dresses with side openings.] Dress 6935 may be described as “orange” in the text, but it really did look yellow-gold in the magazine. 6921 — The Gipsy girdle encircles this attractive slip-over frock with touches of jade-green. It has a straight gathered skirt and is delightful for radium or satin crêpe with contrasting organdy, batiste, or Georgette, etc. Lower edge 60 inches…. For misses 15 to 20 years, also small women. 6904 coat dress — Cool and very smart in town is the coat frock with its saddle shoulders and straight gathered skirt attached at a low waistline. The separate one-piece slip has a camisole top. The color is fuchsia…. Lower edge of slip 44 inches…. The coat dress is for Misses 15 to 20 years, ladies 38, 40 bust. 6927 — Green-striped, smartly bosomed, this one-piece slip-over frock gives the effect of a two-piece style. A cluster of box plaits is inserted at the front. Use flat crêpe, Canton crêpe, satin crêpe, heavy crêpe de Chine, silk broadcloth, shantung, washable silk crêpe, etc. Lower edge, plaits drawn out, 57 inches. The dress is attractive for misses 15 to 20 years, also small women. 6903 — Tiered circular ruffles are attached across the sides of this slip-over one-piece tan dress. Plain or printed silk voile, crêpe Roma, etc., with taffeta tie collar, etc., or satin crêpe with reverse side, are smart for it. Lower edge 44 inches….Chic for misses 15 to 20 years, also small women. 6924 — Crêpe de Chine, heavy Georgette, silk or cotton voile, silk-and-cotton crêpe, pongee, etc., with smocking or shirring and contrasting collar and cuffs are smart for this type of one-piece slip-over frock with straight lower edge. The colors are pervenche blue and tan. Lower edge 51 ½ inches. …For misses 15 to 20 years, ladies 38, 40 bust. Designers are aware that a horizontal line across the widest part of a woman’s body – the hip – will add pounds, visually. That’s why late twenties styles can be so cruel to a less-than-boyish figure. Pattern manufacturers were aware of this problem; Butterick patterns in average sizes assumed that the hip was two inches larger than the bust, as they do today. So it’s useful to pay attention to the many ways these authentic 1920s designs drew attention away from the horizontal hip line that defined the era. Notice all the optical tricks that direct the eye toward the face, or create a slenderizing vertical line to add height and draw the eye toward the center of the torso. Long bows and ties lead the eye up and down. A row of vertical buttons; a vertical center front closing emphasized by a white frill. A strong color – or white – near the face; a V neck; a contrasting collar. The green ‘buckle’ at the center of the dress on the left is also a clever way to draw our eyes to the center of the body. A center front opening that runs from the neck to the hem, creating a strong vertical line. Back and alternate views of page 27 patterns, July 1926.